At the end of the month, I’m embarking on an epic three-day bike ride through the Canadian Rockies. I’m already hearing excuses from my taint to avoid the 90-mile days on the saddle. God knows what your grundle would feel like after 194 days and 18,000 miles. 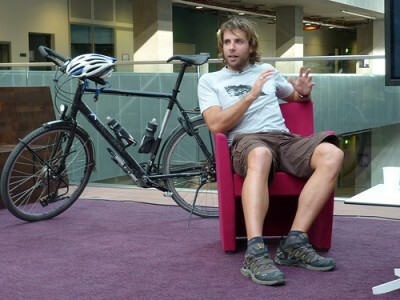 Mark Beaumont did just that, crushing the previous world record by 81 days, and publishing his circumnavigation of the globe in the book, The Man Who Cycled The World. Not having read this book yet, I discovered a few reviews that I thought I’d share. They are generally mixed, but what do you expect? Now, if you’ve been on a bike trip, longer than the typical trip to the local grocer, you may understand where I’m coming from. One might expect dodging Taliban bullets or a courageous internal struggle overcoming the miles. Perhaps incredibly poetical descriptions of wine country or saw-toothed terrain. Really, if margaritas aren’t already blended for him when he pulls into the hotel’s parking lot at the end of the day, I can say there will probably be complaints of crotch soreness and too many mechanical problems, all sprinkled with a few episodes of soul searching and cultural insights. But, as I will aim to do, I will open the book with an open mind knowing that however eloquent this book is, it’s a damn quest. One Mark should be proud of. As you can see . . . mixed reviews. When I mount the trusty green Trek in a few weeks, I may be “satisfying a hunger” inside me. Who knows? I may scream, shout, or cry, too. Or not. The one thing do I know, undeniably, is that I will just cycle.